A regular breeding resident and migrant, the Black-billed Cuckoo was uncommon during the Minnesota Breeding Bird Atlas (MNBBA). Black-billed Cuckoos are found throughout the upper midwestern and northeastern United States, south in the Appalachian Mountains to Tennessee. Two large patches are present from Kansas to northern Missouri and in South Dakota. In Canada, it occurs from the Maritime Provinces to central Alberta. Highest densities are detected from western Wisconsin, through central and northwest Minnesota, to southern Manitoba (Figure 1). Assigned a Continental Concern Score of 13/20 by Partners in Flight and designated a Yellow Watch List species; also listed as a Species in Greatest Conservation Need by the Minnesota Department of Natural Resources, and as a Minnesota Stewardship Species by Audubon Minnesota. Long-distance migrant; winters in South America, but specific distribution is not well known. Large insects, especially caterpillars and cicadas during outbreaks, grasshoppers, crickets, butterflies, and occasionally eggs of birds. Cuckoos are known to consume 10 to 15 caterpillars per minute. Crude, platform-like nest between two branches or close to trunk; relatively low (1–2 m) in thick shrubbery, saplings, or vines. Breeding distribution and relative abundance of the Black-billed Cuckoo in North America based on the federal Breeding Bird Survey, 2011–2015 (Sauer et al. 2017). The Black-billed Cuckoo was described by Roberts (1932) as present throughout the state, but more evenly distributed and more northerly compared with the Yellow-billed Cuckoo. The latter is more common in the southern portions of the state. He stated it was a “common summer resident.” Nests with eggs or young were confirmed in Anoka, Grant, Hennepin, McLeod, Roseau, Sherburne, and St. Louis Counties and at Itasca State Park. A nest was also found in Goodhue County. Forty years later, Green and Janssen (1975) described the Black-billed Cuckoo as a resident throughout the state, but numbers varied considerably, especially in the northern regions. The species was more numerous during outbreaks of tent caterpillars. Janssen (1987) stated it was widespread but never a numerous resident throughout the state. He reinforced that it was more common in the northern forests during outbreaks of tent caterpillars. He reported confirmed nesting records since 1970 from 28 counties, ranging from the northeast and northwest to southwestern Minnesota. Many nesting records existed in the Twin Cities metropolitan region, where observers were also numerous. However, there were no records from the extreme southeastern portion of the state. Janssen highlighted an unusual late nesting record from Sherburne County on September 8, 1974. Hertzel and Janssen (1998) added 6 additional counties to the confirmed nesting of the species since 1970, including 3 from the southeast: Fillmore, Olmsted, and Winona. The Minnesota Biological Survey recorded 514 locations from virtually all of the counties that have been surveyed (Minnesota Department of Natural Resources 2016). No observations were recorded from Cook County, nor from several counties in the south-central, western, and southern tier of counties in the state. Except in Cook County, this absence is likely due to the status of tent caterpillar populations during the surveys as well as the lower densities of trees and suitable nesting or foraging habitat in many of these areas. This species can be rare or difficult to find when food sources, such as tent caterpillars, are rare. MNBBA participants included 739 records and substantiated the Black-billed Cuckoos’ wide distribution across the state with the most records of possible nesting (Figure 2). The species was recorded in 13.2% (625/4,741) of the surveyed blocks and 17.9% (418/2,337) of priority blocks. Breeding was confirmed in 29 blocks (Figure 3; Table 1). A total of 11 counties had confirmed nesting records that had not previously been reported. Breeding records were detected in every county in the state except 7 counties in southern Minnesota: Le Sueur, Lincoln, Martin, Meeker, Murray, Nobles, and Scott. One probable nesting record straddled 2 counties, Blue Earth and Nicollet, also in southern Minnesota. The MNBBA probability distribution map shows that highest densities were predicted in northwestern Minnesota, primarily in the Tallgrass Aspen Parklands Province (Figure 4). Additional areas with higher densities were in west-central Minnesota and scattered areas along the Mississippi River floodplain of southeastern Minnesota. Low densities were predicted throughout much of Minnesota, except for a substantial portion of southern Minnesota and in the extreme northeast. The Black-billed Cuckoo’s predicted distribution is consistent with data from the federal Breeding Bird Survey (BBS), which show that it is most abundant from central Minnesota to the extreme northwestern portion of the state (Figure 1). Hughes (2001) described historical northward movements into New York State, Quebec, Ontario, and the Maritime Provinces in the late 1800s and early 1900s. She suggested that a reason for these expansions was the production of suitable edge habitat resulting from conversion of primeval forests to agricultural land. During breeding bird atlases, both Wisconsin (Cutright et al. 2006) and Michigan (Chartier et al. 2013) reported that the species is more common in the northern portions of these states than in the south. Black-billed Cuckoos were known in the late 1880s to occur in large flocks between food sources, but those flocks are a thing of the past (Pfannmuller 2012). Historical records from the midwestern United States are limited on whether the species has expanded northward over the past 150 year or if its current distribution is typical. The species’ considerable variation in populations during tent caterpillar outbreaks can also obscure its distribution. Hence, suppositions about historical changes in the distribution of this species in Minnesota remain inconclusive. Breeding distribution of the Black-billed Cuckoo in Minnesota based on the Breeding Bird Atlas (2009 – 2013). Summary statistics of observations by breeding status category for the Black-billed Cuckoo in Minnesota based on all blocks (each 5 km x 5 km) surveyed during the Breeding Bird Atlas (2009-2013). Summary statistics for the Black-billed Cuckoo observations by breeding status category for all blocks and priority blocks (each 5 km x 5 km) surveyed during the Minnesota Breeding Bird Atlas (2009-2013). Predicted breeding distribution (pairs per 40 hectares) of the Black-billed Cuckoo in Minnesota based on habitat, landscape context, and climate data gathered during the Minnesota Breeding Bird Atlas (2009-2013) using the General Linear Modeling method with an adjustment for detectability. Black-billed Cuckoos are broadly described as occurring in groves, forest edges, pastures, abandoned farmlands, shrubby wetlands, and deciduous and mixed deciduous forests, especially associated with trembling aspen and birch (Robbins 1991; Hughes 2001). A common word in many habitat descriptions is “thicket” because the cuckoos are often found in dense vegetation, such as shrubbery, vines, and young trees (Figure 5). The species’ use of such habitat explains why nests are difficult to find. Habitat data on MNBBA point counts indicated a strong association with shrub wetlands, marsh/wet meadows, and upland grasslands (Figure 6). The association with these habitats is consistent with the Black-billed Cuckoo’s use of semi-open areas with edges and moist conditions. These habitats are more common in the northwestern portions of the state, which partly explains the higher densities of cuckoos found there. Hughes (2001) also noted the species’ frequent association with water. The Minnesota National Forest Bird (NFB) Monitoring Program found the species in a wide variety of habitats, most prominently in open dry and wet areas, lowland shrub, regenerating forests, and upland forests of aspen-birch and northern hardwoods (Niemi et al. 2016). Galli et al. (1976) and Martin (1981) suggested the species is sensitive to fragmentation of habitat, because it was not found in small forest plots in New Jersey nor in small shelterbelts in South Dakota. Typical breeding habitat of the Black-billed Cuckoo (© Gerald J. Niemi). Habitat profile for the Black-billed Cuckoo based on habitats within 200 m of point counts where the species was present during the Minnesota Breeding Bird Atlas (2009-2013). Partners in Flight estimated a breeding population of 870,000 individuals with a U.S. population estimated at 410,000 individuals. The population in Minnesota was estimated as 90,000, or 10.9% of its global population (Partners in Flight 2017). The Black-billed Cuckoo represented one of the few species with a lower estimated population in Minnesota compared with Partners in Flight. MNBBA estimated a population of 73,000 individuals; however, the 95% confidence interval was 52,000 – 446,000 individuals and within the range predicted by Partners in Flight. The wide confidence interval is due to the high annual variability of the species population which is consistent with a species associated with insect outbreaks. The species’ song can be detected over a long distance, which also renders population estimates more difficult. BBS estimates for Minnesota from 1967 to 2015 indicated a nonsignificant trend, but the pattern of fluctuation had a definite cyclic pattern (Figure 7). Peaks in the detections occurred in 1971, 1979, 1988, 1989, and 2001, but no additional peaks have occurred through 2015. In contrast, Michigan, North Dakota, and Wisconsin had significantly declining trends during this same period. Manitoba had a nonsignificant trend but a tendency toward a decline from 1966 to 2015. Manitoba also had a cyclic pattern, with peaks in trends in 1971, 1975, 1978, 1988, 1991, 1998, and 2012. Cyclic patterns were also detected in Wisconsin in 1972, 1981, and 1990, and in North Dakota in 1967, 1972, 1979, and 1991. Both states have not recorded a peak in detection since the early 1990s, and Michigan has never had a peak in detections since the BBS began in 1966. The cyclic patterns in the states and Manitoba are not in synchrony, however. Pfannmuller (2012) suggested that the BBS trend indicated a population cycle every 8 to 9 years, but, as noted, no peaks have occurred from 2002 to 2015. During the NFB Monitoring Program, Niemi et al. (2016) noted some of the largest numbers of Black-billed Cuckoo in the years 2000, 2001, 2006, and 2007, but the peak signals were not overwhelmingly convincing. Hughes (2001) emphasized that populations are highly variable depending on food availability; large localized influxes occur during insect outbreaks. The patterns in the peaks observed are likely due to outbreaks of tent caterpillars or in some situations of cicadas. The declining trends are widespread across North America, but northwestern and west-central Minnesota are among the few areas that currently show an increasing trend (Figure 8). Increasing trends were also observed in the northern fringes of the species’ range in northwestern Manitoba and central Alberta as well as central and eastern Ontario in Canada. Partners in Flight estimated a 68% decline in the North American population from 1970 to 2014 (Rosenberg et al. 2016). The NFB Monitoring Program’s data indicated a nonsignificant trend in the Superior National Forest but a gradual increase from 1995 to 2005 and a gradual decline back to 1995 levels in 2016 (Figure 9). Population density estimates are difficult to determine because of the high variation in the populations from year to year. The NFB Monitoring Program’s study from 1995 to 2010 recorded 455 individuals, with densities in the Chippewa and Superior National Forests of 0.02 and 0.06 pairs per 40 ha, respectively. The highest mean number of Black-billed Cuckoos detected on BBS routes in North America was in Minnesota, with 1.9 detections per route from 1967 to 2015. In Manitoba the mean was 1.0 detection per route; in North Dakota, 1.2; and in Wisconsin, 1.3 (Sauer et al. 2017). 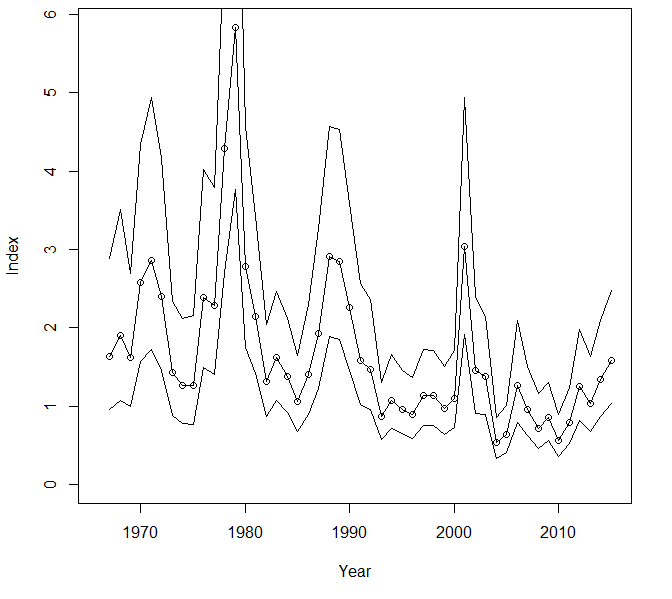 Breeding population trend for the Black-billed Cuckoo in Minnesota for 1967–2015 based on the federal Breeding Bird Survey (Sauer et al 2017). Population trend map for the Black-billed Cuckoo in the United States and Canada for 1966–2015 based on the federal Breeding Bird Survey (Sauer et al. 2017). 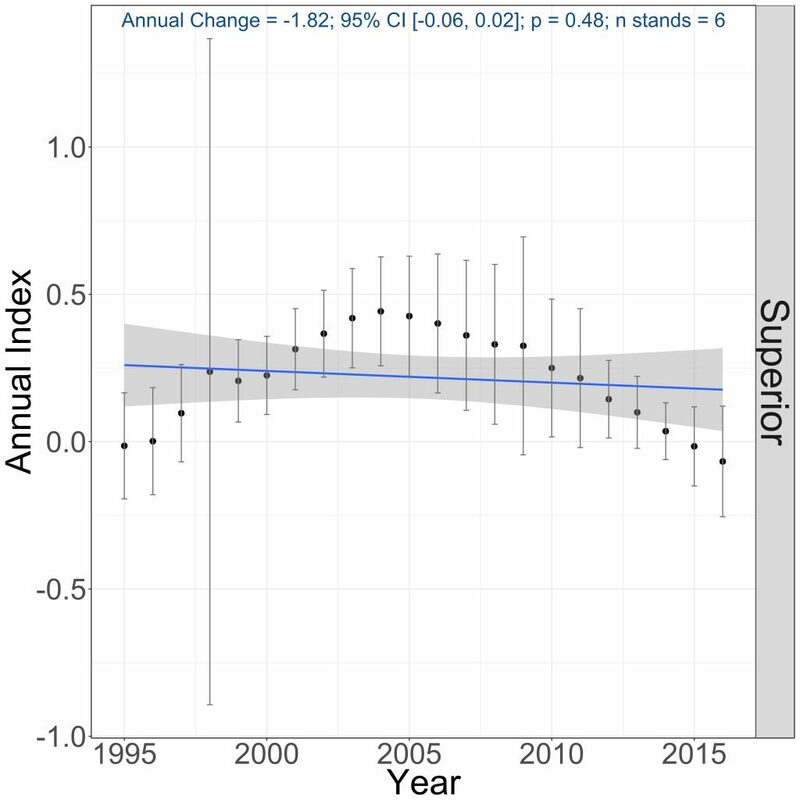 Breeding population trends of the Black-billed Cuckoo in the Superior National Forest, 1995–2016 (Bednar et al. 2016). Partners in Flight (2017) identified the Black-billed Cuckoo as a Yellow Watch List species with a Continental Concern Score of 13/20. The species’ high score was largely driven by its estimated population decline of 68% since 1970 and to a lesser extent by its overall small population size and threats to its breeding and wintering populations. Partners in Flight’s (Rosenberg et al. 2016) major goal for the Black-billed Cuckoo is to slow the rate of population decline by 60% to 75% by the year 2026 and to increase its population by 5% to 15% by 2046. The species is listed in Minnesota as a Species in Greatest Conservation Need because of its overall population decline and because its population is no longer considered to be within the normal range of population variation (Minnesota Department of Natural Resources 2015). Minnesota has a substantial responsibility to the species because over 10% of its breeding population (Pfannmuller 2012) occurs in the state. The Minnesota State Wildlife Action Plan (Minnesota Department of Natural Resources 2015) has identified a number of Conservation Focus Areas that could potentially benefit the species, such as the Aspen Parklands and the Pine-Sands South areas, but the Black-billed Cuckoo is not listed as a target species for conservation action within either of those areas. Causes for the Black-billed Cuckoo’s decline are unclear, but food supplies, effects of pesticides that have reduced populations of insects, especially caterpillars, and habitat changes are all among factors suspected as important. The species has also been identified as potentially sensitive to habitat fragmentation (Galli et al. 1976; Martin 1981). Hughes (2001) commented that it is frequently killed at television towers and tall buildings during nocturnal migration. Hughes emphasized also that its South American winter distribution is poorly known. The species is identified as “climate threatened” by Langham et al. (2015) and the National Audubon Society (2015), which projects that only 28% of its current summer range may be available by 2080. However, if food supplies are able to move north and west with the changing landscape, more habitat may be available. Unfortunately, there are few specific management or conservation actions identified for this secretive and elusive species, possibly because the Black-billed Cuckoo remains an enigma. Little is known about the status of its food supplies other than that it eats caterpillars and cicadas when available. It may be sensitive to habitat fragmentation and is potentially vulnerable to collisions with towers and windows during migration. It spends its winters somewhere in South America, but exactly where is unknown. Along with the effects of climate change, there remain many questions about the future of this species. Galli, Anne E., Charles F. Leck, and Richard T. T. Forman. 1976. “Avian Distribution Patterns in Forest Islands of Different Sizes in Central New Jersey.” Auk 93: 356–364. Martin, Thomas E. 1981. “Limitation in Small Habitat Islands: Chance or Competition?” Auk 98: 715–734.